A great Mini-Series from Stephen King, not based on a previous work. 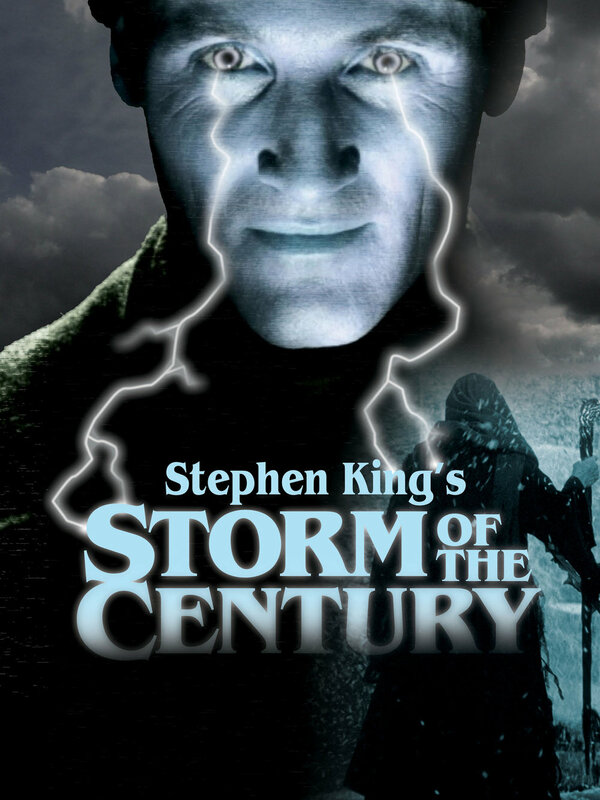 ﻿Storm of the Century is a made for television horror mini-series that was brought to us from Stephen King. It had aired on TNT in 1999. I remember seeing the ads for this on television when I was in high-school. It didn’t grab me. I couldn't connect with it for some reason. It looked weaker than other King presentations like IT! or The Stand. But I was wrong. 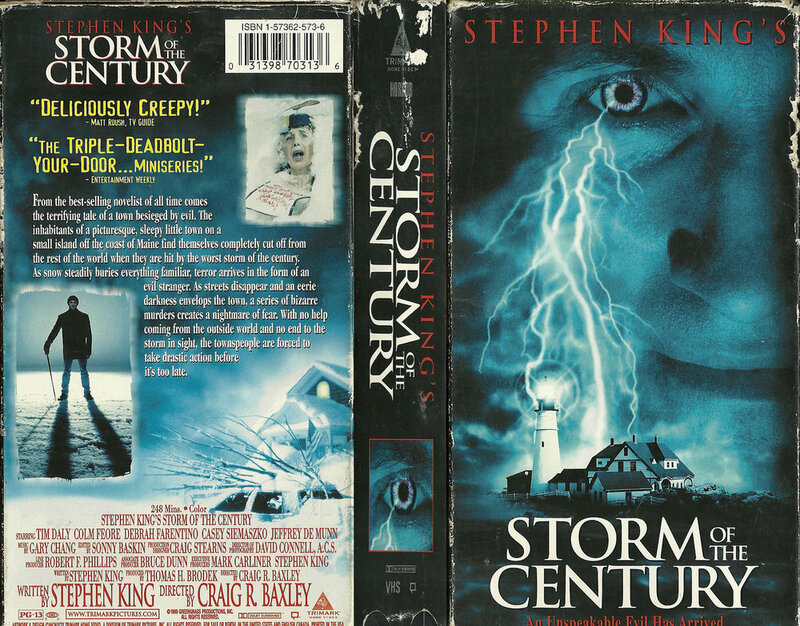 Storm of the Century is a highly suspenseful feature that wasn’t based on any of King’s previous work. It’s a completely original production. Little Tall Island, in Maine, is a quiet community that seems isolated from the rest of the world. A blizzard is blowing into town though. Not just any blizzard. This might be the biggest white-out yet, and it isn’t just bringing freezing snow and howling wind, its bringing evil. An ancient evil that calls itself, Andre Linoge, has arrived in town just as the storm begins. He makes certain demands and orders that the town comply, for if they do not, he has the ability to murder them all. Stephen King had written this mini-series as a screenplay from the beginning. It’s unique. Most of his work to this point had all been adaptations of his work. Since this wasn't an adaptation we didn't have to worry about leaving out any important plot elements that would have to be trimmed. What we got was an effective picture that keeps you on the edge of your seat for the entire viewing. The villain, Andre Linoge is great. He is cold and calm through the entire film. He doesn’t lose his cool at all. The dread he shrouds over Little Tall is suffocating. That’s where the tension builds. Linoge might be linked to Stephen King’s other work. He is a demonic wizard that could be related to the King-Verse character, Maerlyn. Maerlyn is also a demon wizard of the Prim. He also goes by the name LEGION, a name shared by King-Verse character Randall Flagg and Maerlyn. This all means that Linoge has terrifying amounts of power. In Storm of the Century we watch this force tear apart an entire town both physically and emotionally. It's impressive. Craig Baxley was behind the camera directing this feature. He did a great job. It gets your blood pumping and delivers the fear without going overboard. It’s chilling, rough and depressing. Making it effective and thought provoking. It’s definitely earned a spot as one of my favorite Stephen King television films.